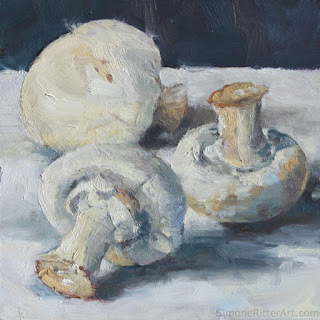 Last post I shared with you my white mushroom paintings, today I share with you my white eggs. 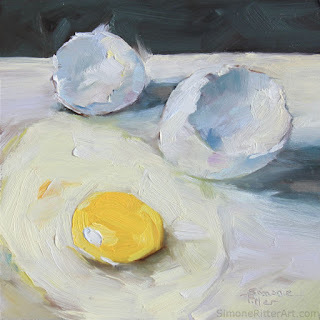 Yes, I always had wanted to paint a raw, cracked egg. The translucent white in contrast with the bright yellow yolk fascinates me. 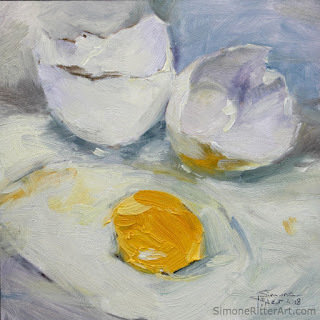 To give it a try was the start to my January theme of painting all yummies that could go into an omelet. I cracked the egg onto a white plate to forgo the mess of cleaning up, haha. Here's a photo of one of the egg paintings on a tray with some of the other veggie paintings. If you have been following me on my Instagram or Facebook feeds, you have seen my 'in situ' shots and studio shots frequently. Each of these 6x6in paintings is available for sale. $100 incl. shipping. Also, $15 from each sale will be donated to 'Backpack Blessings and Beyond' who help local school children that face food insecurity. They have backpacks filled with food waiting by the school entrance each Friday as they head home for the weekend. What a wonderful world it would be if every child would have a belly filled and no worry if there's food in the fridge. Yup, it might sounds really funny when I say I am studying to paint whites, ey!? The longer I paint, the more I 'look between the lines'. Meaning, I try to train my eye to see more distinct differences between cold/warm, colours, shadows, lights, edges and so on. One of the more tricky things I find is to see the different shades of white. For example a white house might look really different on a sunshine-y day where the sunlit side looks a warm yellow and the white siding on the shadow side really is a purple-y blue. In contrast, on an overcast day the same house might look more grey-ish overall. Our brain tells us it is a white house, but our eyes (if we really look) tell us different. Allowing to see things as they really are makes for a treasure hunt and a treat to explore. As mentioned in my former post, from each painting sold, $15 will be donated to charity: 'Backpack Blessings and Beyond'. You can read more about it here or here. The group of volunteers is filling backpacks with food that school children who face food insecurity take home each weekend. My kids' school is spearheading this outreach currently helping kids in 4 local schools. I hope you all got a good start into this year and are safe and warm during these frigid winter temps! As for me and my family, we have enjoyed a few nice and quiet weeks over the holidays and now into January. Yes, and painting I have been as well- almost daily actually! 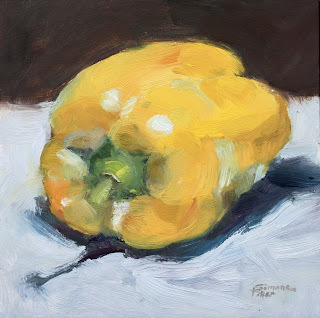 I started a fun series of 6x6in oil paintings of food. As per comment on my social feed I called it: Let's Make An Omelet! 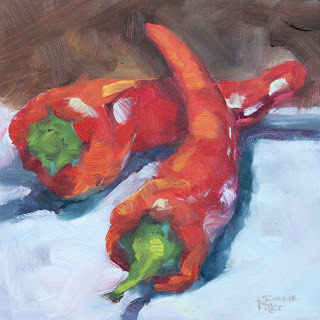 Today I want to feature the peppers from the series. A yellow pepper, a red one, green one and two small red hotties. I hope to have my website updated over the weekend, listing each painting individually (if you want more info on a specific painting). Each of these 6x6's is for sale for $100 (incl. shipping to Canada and the Continental US) and in the spirit of St. Valentine's Day I will donate $15 from each sale to 'Backpack Blessings and Beyond' charity. Red Spicy Peppers, oil on board, 6x6in, SOLD thank you! What is 'Backpack Blessings and Beyond'? 'Feed School Kids, No Matter The Cost' is their mission statement. The program buys food for school children that live in homes that face food insecurity. Before the kids leave school on Friday, the volunteers have food-filled backpacks lined up by the school entrance. The kids that are in the program know to look for them and grab a bag on their way out. The other kids don't know and so there is no stigmatism. My kids' school is spear heading the program for St. George, Black's Harbour and Back Bay area schools. The program has been established about 5 years ago is providing weekly bags in 4 schools so far. Cost per backpack is $20 monthly or $240 per year. This program is run by a handful of volunteers and caters to the very vulnerable of society and so I hope to give them a little plug and encouragement and a cheque on Valentine's Day. 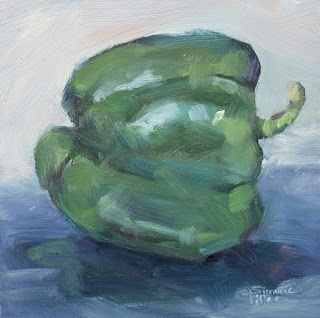 Tomorrow I'll showcase more paintings from the series, they were so much fun to paint! It has become a tradition by now. Calendars! I love creating these fun calendars featuring my art. A few years back, the whole calendar idea started out as the climax of a month long painting-a-day marathon. Vintage camper owners submitted photos for a chance to have their glamper photo painted and featured on my blog and social feeds. I was painting a vintage camper trailer each day, followed by a public voting. The crowd favs that gathered the most votes were featured in my first camper calendar. People loved the idea and sent in more photos than there were days in the month! And by the end I had created 30 paintings in one month! Let's fast forward a few years to 2017. Our local VW enthusiasts have been hosting a 'Gathering of Friends' VW meet at the local Kiwanis Oceanfront Campground in St. Andrews, NB, Canada. Jenny and her husband Barry invited me to come down to the campground and paint at my leisure while the group was set up. And I did just that! It was so much fun to pitch my easel in the midst of reno-chatter and the sharing of tips and tricks to tackle specific vintage VW issues. I heard phrases of water cooled engines and sealing leaks Kids were running around and the summer weather was perfect. I even met some proud Volkswagen owners! This past summer I went back, just for a few short hours, unfortunately. 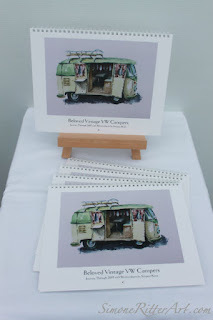 But over the last year I created enough VW bus paintings to fill this 2019 calendar. I still have a few available! So if you are looking for a year-long gift for the VW lover on your list, here's a video. 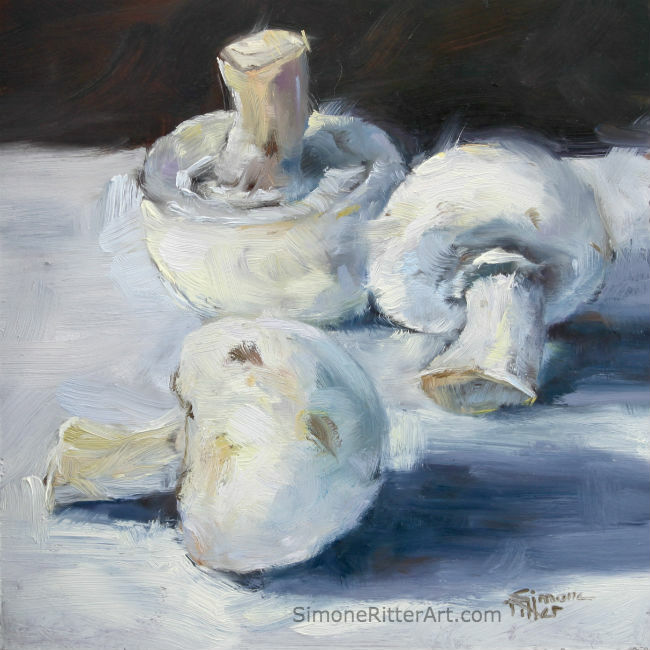 You can order through my website www.SimoneRitterArt.com or pick up in person at our restaurant, Europa Inn, downtown St. Andrews. Thank you for taking time, it surely is a busy time of year for everyone! Thank you for your continued encouragement and journeying with me. I wish each and everyone of you a blessed Advent and a Merry Christmas! This one took me a bit longer to paint. 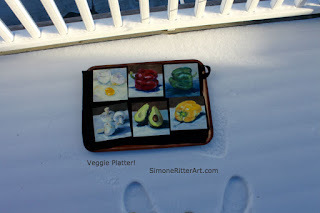 I am determined to not give up with the sub zero temperatures the East Coast has seen lately. 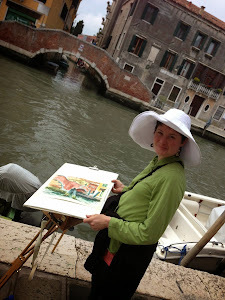 So I strapped my oil painting kit and tuckered off down to the wharf to do some paintin'. Smart thinking I was loaded with hand warmer pads, ski pants and triple layers underneath my down coat. I guess I must have looked like the Michelin Man wobbling down the street. I have to say I stayed warm until almost to the very end when the sun went down and my fingers and toes got nippy. Making myself go out does my spirits well as they are lifted in the fresh breeze and with the sunshine. Winters are hard for me here, German winters are shorter and not as harsh, and I have to admit that I never really have adjusted to the winter climate here. My dear husband has just put in an order for a 'mood light' to help me beat the winter blues. It hasn't arrived but I'm looking forward to indulging in a daily dose of 'happy rays'. Only 50 more days til Spring, yey! 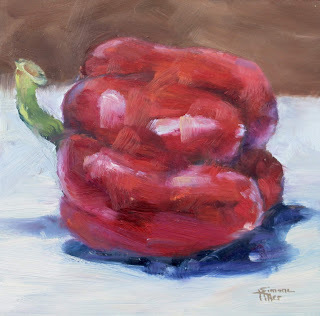 Hope to being able to share more painting with you soon! Thank you for stopping by! !